1884 columned house on a full city block in Columbus. We have several areas for outdoor weddings with 100 guests or fewer, and an area for tented receptions. One room rental is also required for bride/wedding party preparation. We are also alcohol-free except for bride-groom toast. We do not charge for decorating time, rehearsal time. Wedding party is responsible for tent rental, chair rental, catering. Private Events Package Starting At $50 Per Hour/depends on number of guests, day, date, and time. The Whimsy Garden in the northwest features unusual garden ornaments, such as Tree Face. We are available to host small weddings, receptions, birthday parties, and the like. We welcome business travelers, and offer corporate rates. We offer free Wi-Fi throughout the house and complimentary refreshments and snacks. The fountain is the centerpiece of the rose garden overlooked by the main porch. The Ruddick-Nugent House, a Columbus, Indiana bed and breakfast, offers a relaxed atmosphere with peace and quiet. Please visit our website for more details. Wedding Package Starting At $200 for the first hour, $100 per hour thereafter. The Whimsy Garden in the northwest features unusual garden ornaments, such as Tree Face. We are available to host small weddings, receptions, birthday parties, and the like. We welcome business travelers, and offer corporate rates. We offer free Wi-Fi throughout the house and complimentary refreshments and snacks. The fountain is the centerpiece of the rose garden overlooked by the main porch. 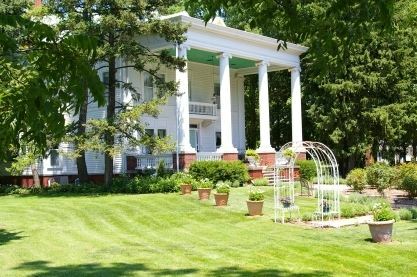 The Ruddick-Nugent House, a Columbus, Indiana bed and breakfast, offers a relaxed atmosphere with peace and quiet. Rates: • Starting at $200 for the first hour • $100 per hour thereafter. Please visit our website for more details. For non-wedding events, price is based on number of guests, hours, day, and time of day. Contact us for complete terms & conditions.